A few of my decks and the cozies they live in. Some tarot decks come in absolutely beautiful boxes. The Mary-El Tarot, for example, came in a heartbreakingly gorgeous box. And then what do I do? I store the boxes in a file drawer and knit a cozy to store each deck in. Why would I do such a thing? Am I not just creating more clutter? Am I not just making it hard to tell which deck is which? Let’s deal with the last question first. I used to put all my decks in organza bags that are relatively see-through. But then I ran into the problem of what to do with decks that are huge and don’t fit into organza bags. I started knitting for those decks. But then here’s what happened: the first deck that I knitted for really liked being cozy. My readings with that deck suddenly became more detailed and intimate. The deck seemed more interested in talking to me than it had before. And the other decks that were stored next to it started clamoring for their own cozies. Even the Darkana! In fact, ESPECIALLY the Darkana! Dark decks seem to want petting and cosseting as much as any other deck, if not more. A rose quartz crystal peeking out of the pocket I made for it on the cozy belonging to the teeny tiny Rider Waite. And too, I quickly started wanting to store my decks with crystals. If I nestle a crystal into a basket with a bunch of cozied decks, nobody gets hurt. The deck doesn’t get scratched, and neither does the crystal because any other crystals in the basket are on the other side of something cozy. 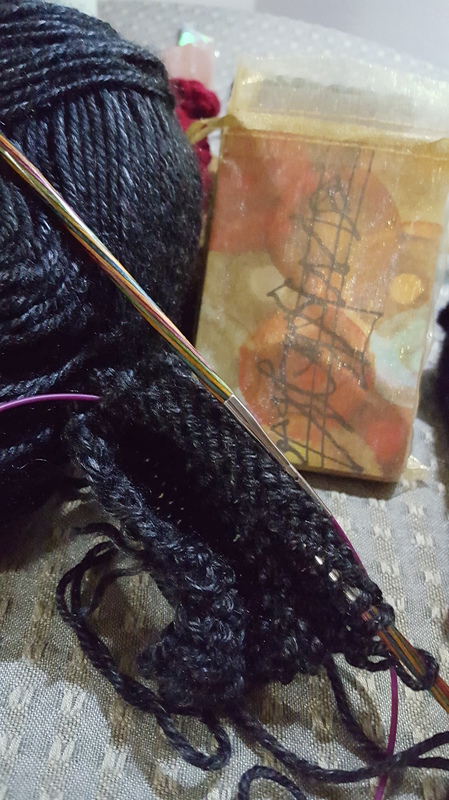 But then I branched out–recently I started knitting little pockets for my deck cozies, so that a deck could have its own crystal stored with it, and they could both be cozy! Coziness for all! The Osho Zen waiting for its cozy, still on the needles! A really nice thing to add to this process, of course, is to hold an intention in mind as you knit, perhaps even repeating a word or mantra with each stitch. Try it–you may be surprised at how much more personal your relationship with a deck becomes once you have made it a cozy present to live in.